Contiguous with other undeveloped rainforest fragments and far from human settlements, it is a perfect home for endangered orangutans. Over 200 orangutans who have been forcibly evicted from their homes have taken refuge in the Orangutan Legacy Forest. Orangutan presence is readily visible within the peat swamp areas where the verdant forest canopy is festooned with orangutan sleeping nests. 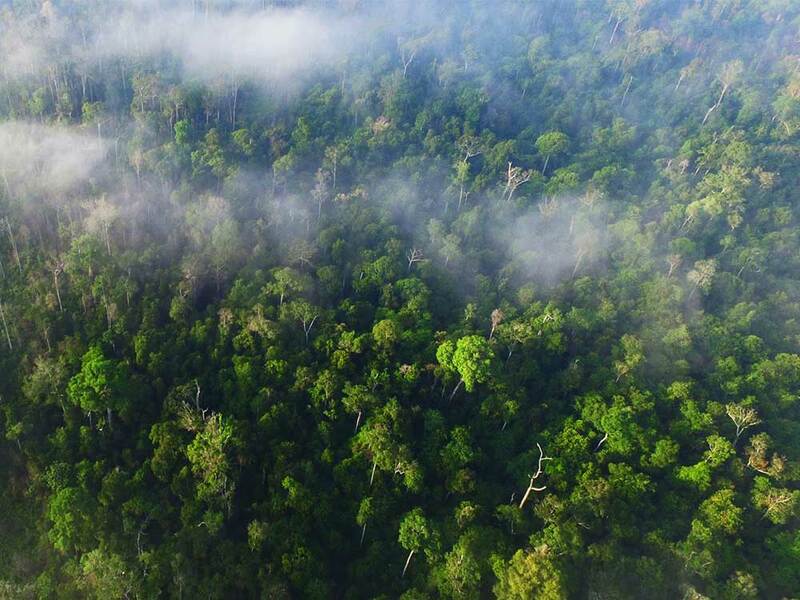 An exemplary Southeast Asian biodiversity hotspot, this forest is also home to sun bears, clouded leopards, wild pigs, mouse deer, rusa deer, long-tailed macaque monkeys, pig-tailed macaque monkeys, proboscis monkeys, red leaf-eating monkeys, and agile gibbons—some found nowhere else in the world. 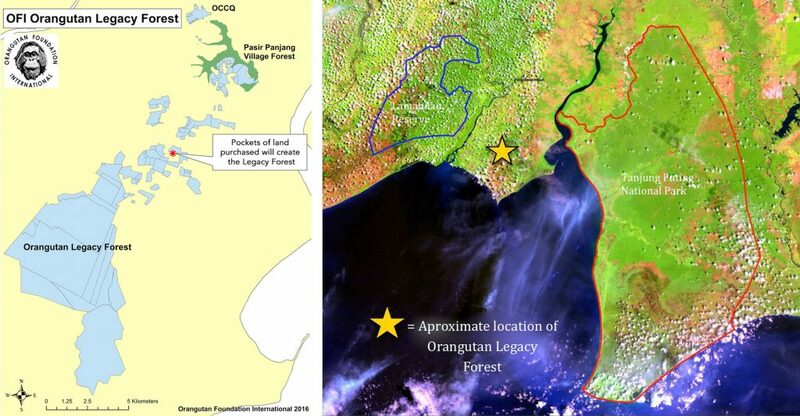 Location of the Orangutan Legacy Forest. Orangutan means ‘man of the forest' in the Malay language. In the past 60 years, their population numbers have dramatically decreased with numbers declining by more than 50% and their habitat has been reduced by at least 55% in the last 20 years. Currently, there are an estimated 104,700 Orangutans left in the wild. Orangutans are known as the gardeners of the forest. These clever animals play a critical role in maintaining the health of the ecosystem of the forests they inhabit through seed dispersal. By protecting Orangutans' homes, we are protecting other endangered animals including Sumatran tigers, Sumatran elephants plus Sumatran rhinos moreover benefiting local communities and other species. Orangutans face many threats including road development, illegal timber harvesting and illegal wildlife trade. However, the production of palm oil is by far the greatest threat to Orangutans. Huge amounts of land have been cleared to make way for massive palm plantations. This land is being cleared to keep up with the demand for palm oil by consumers, which is found in over half of all packaged products in supermarkets around the world. Palm oil plantation in Borneo, Indonesia. The land has been increasingly cleared to support the production of palm oil and orangutans are left homeless and vulnerable. If lucky, the orangutans are saved and make their way to a rehabilitation centre. Unfortunately, many are left susceptible to starvation, disease or predation by humans. Often mother orangutans are killed with their babies taken away and fallen victim to the illegal pet trade industry. 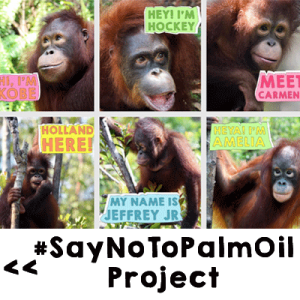 For the 330+ orangutans currently being cared for by OFI, the Orangutan Legacy Forest truly is ‘the promised land’. Each month orphaned orangutans enter OFI’s rehabilitation program.